The stunning new Leisure Cookmaster range cooker, with its traditional design and exceptional culinary versatility, will have your guests wanting to eat every meal at your house. Delivering joy into your kitchen, Leisure has integrated even more quality and professional elements into the new designs including larger capacity ovens, separate quick heating grills, metal handles and premium chrome knobs. The classic Cookmaster is the perfect centrepiece at the heart of your home to wow friends and family when entertaining. 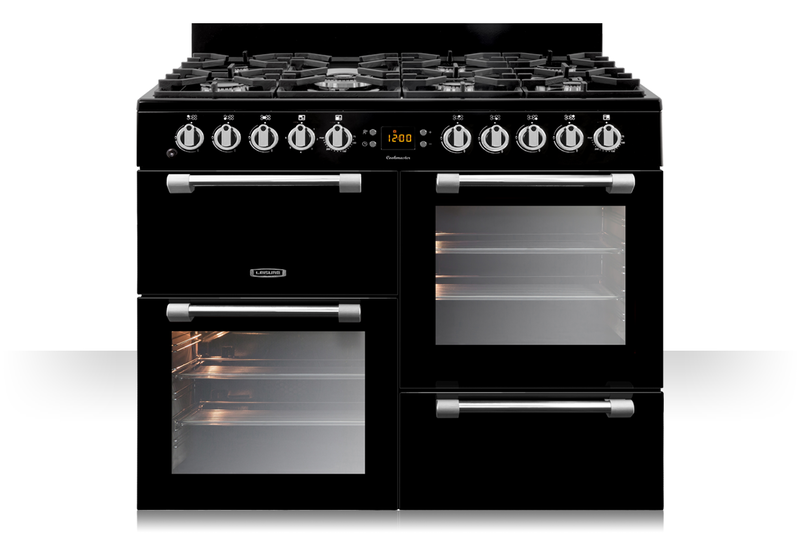 Integrating high quality features throughout, further standout points of the Cookmaster includes full glass inner doors and cook clean catalytic liners as well as a 7-burner hob carefully designed with a streamlined top that eliminates areas for dirt to accumulate, meaning your energy is spent cooking up a storm rather than scrubbing. Available in silver, black, cream, regency red or sky blue and in electric, gas or dual fuel, this sleek yet traditionally styled Cookmaster range cooker is the ideal partner to help you deliver every day meals for your family or a creating a menu for someone special.